The robotics Team 4262 approached design development a little bit differently this year. 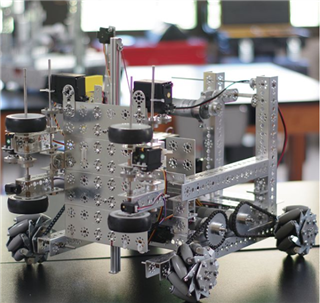 Students designed a robot using a 3D modeling computer program. Then Mr. Park locked away all the building tools in a closet and challenged them to develop a final model using only the software. The robots were constructed to have the exact dimensions of the model. On December 9 and 10, teams 4262 and 9266 competed in the first First Tech Challenge league meet, with Team 4262 getting the highest score of the tournament!